The year is 1969 and London is “a country [sic] coming down from its trip.” No-one could better understand this declaration made by the drug-addled dealer in Withnail and I than the films’ Executive Producer George Harrison and its’ Special Production Consultant Richard Starkey, otherwise known as Ringo Starr -no-one except perhaps writer/director Bruce Robinson who created this seriously seedy film based on his own experiences as an out of work actor. Never was there a more disgusting environment than the one inhabited by the wild-eyed, scrawny Withnail (played to perfection by Richard E. Grant) and the narrator ‘I’ (a more restrained Paul McGann). There are things in their kitchen sink that only a steady stream of alcohol and drugs could make them ignore. And when those run out, there’s always lighter fluid and anti-freeze. Reflecting the aforementioned quote by the Zen-like Danny (Ralph Brown), these two flatmates are coming down from some kind of crazy trip and, realising the gravity of their situation, wisely decide to take a healthier one, this time to Withnail’s uncle’s cottage in the country. Robinson uses dialogue snatched from the mouth of Franco Zeffirelli, who apparently hounded him when he played Benvolio in his 1968 film Romeo and Juliet, to paint a wonderful portrait of the lecherous intellectual homosexual Uncle Monty. Richard Griffiths lends the full weight of his substantial figure to this character who comes across like an earlier, more lascivious version of his Hector in The History Boys. But it’s the teetotaller Richard E. Grant who stays in the mind for his brilliantly wired performance as the alcoholic Withnail. 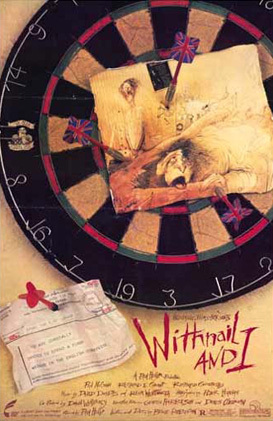 With some of the greatest hits of the ’60s on the soundtrack, Withnail and I is like the crashing hangover of one of the wildest decades in history …with belly laughs.